Ok, ok, so I've just had an exciting idea for space travel, and I thought that this would be a good place to share it. Some opinions (maybe there are some nuclear engineers or such browsing this page) are welcome. A ship that uses a LFTR reactor to power a beefed up ion thruster with specific impulse in the tens of thousands of seconds, AND doesn't need to carry much propellant (perhaps an initial charge before the reactor spools up) because it gets produced in the reactor itself. Separate it from the salt (which is easy; one is a gas, one is a liquid), and feed it to the ion drive. An NEP with a mesmerising potential. If you give an aero engineer a list of potential types of reactors he can use to power his jet engines, he will invariably choose the one that is most compact and light (I should know, I'm an aero engineer...). So, although I have no proof whether that was actually the case, I suspect that this type of reactor is extremely light and compact compared to it's opponents. For nuclear-electric systems, it's not just the reactor, but also shielding, all the power conversion machinery to turn thermal power into electrical power, radiators, etc. And the mass does still matter in space. As for the xenon, just consider the relative mass of the reactor fuel and a typical xenon propellant tank. A reasonable craft might carry a few tens of kg of fissile fuel and burn only grams of that during any given trip, while carrying multiple tons of propellant...even the Dawn probe carried 425 kg of xenon. You're just not going to get enough xenon to be worth the equipment needed to collect it. There are conceptual designs for fission fragment rockets that actually directly use the fission products as reaction mass. These have specific impulses in the range of 100k to 1M seconds, but due to the geometric issues of allowing the fission fragments to escape the fuel, they wouldn't be liquid salt reactors...the fuel would be something like fine wires, thin disks/ribbons, or suspended particles of dust. The shielding in particular poses a significant weight problem, which was essentially what killed the Cold War nuclear-powered bomber programs (though the Soviets were able to get their prototype to fly by deliberately using inadequate shielding). 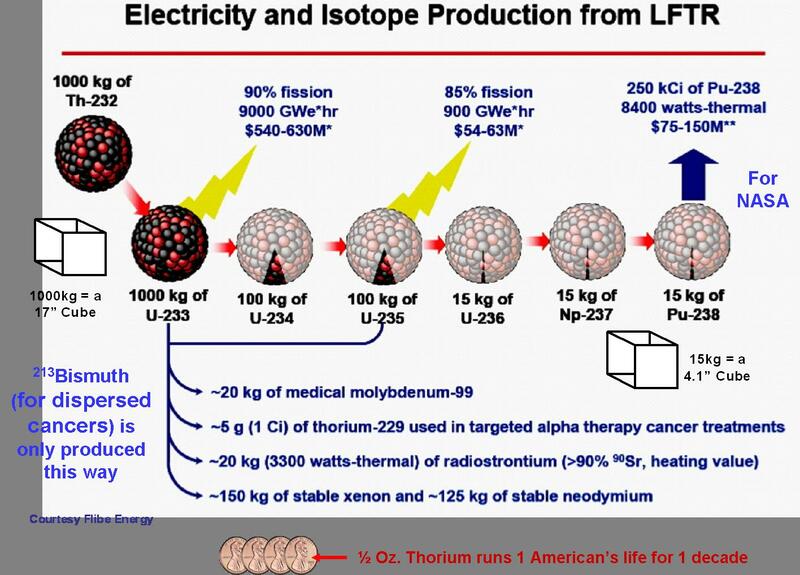 It seems to me that 1000 kg of thorium would produce 125 kg of xenon. That's not a small amount, it's roughly an eight' of it's mass. Trying to see viability would mean seeing what the necessary Isp of said engine would have to be. That means seeing how much energy each kg of propellant would have (as kinetic energy in a electric thruster). So, turning 9000 Gw*hrs to joules, we get 324*10 to the power of eleven joules in total. This is the total energy given off by 1000 kg of thorium (actually it's daughter U-233, but I digress). This is applied to 125 kg of propellant via Newton's Law, where energy is mass times velocity squared divided by two. Working backwards to find velocity, we obtain a speed of 720000 meters/sec. Thus an Isp of 72000. This is about three and a half times the Isp of the Ds4g thruster I mentioned earlier, but is doable, especially since we know the operating principle of the ds4g can be scaled up (dual-stage 4 grid means 2 stage; just add more stages for higher velocity). I'm ignoring the efficiency of the drive (which is about 85 percent; thus the Isp needn't be as high). Comparing to Dawn is misleading, because Dawn had an Isp of only 3100 (thus a jet speed of only 31000 m/sec). A spaceship can simply separate the reactor from the payload and use a shadow shield. This is less useful on Earth because of backscattering in an atmosphere, and because the aircraft has a physical limit to size and weight. This would not apply here. The "two stages" in the DS4G are ionization and acceleration. Existing thrusters ionize (or rather, extract the ions from the grid where they ionize) and accelerate in one step, which is simpler but limits the electrical potential between the grids. They add a fourth grid to handle the acceleration. You can't just add more stages or ramp up the voltage indefinitely to get higher velocities without tradeoffs. They estimate an achievable specific impulse of 19300 s (190 km/s) for their system. Dawn had a lower specific impulse, but it also had a dry mass of only 750 kg. And space fission reactors will be relatively inefficient, due to the difficulty in radiating waste heat. If you have an incredibly high specific impulse drive, it'll work. At 10% system energy efficiency, you'd get 6.5 Mm/s exhaust velocity, 35 times the exhaust velocity and 1200 times the specific exhaust power. We don't have such a drive and aren't close to having one. Anything less than that, you're burning thorium and dumping unused power so you can use thorium as a xenon source that outmasses the xenon it provides by a factor of 7 (somewhat wasteful), or carrying tanks of xenon that trivialize what you're getting from the thorium. With anything we might build with near-current technology, you might extract xenon for propellant from stationary power plants, but spacecraft reactors aren't going to burn enough thorium to make it a useful addition to their own reaction mass. And for some far-future system, why would you limit yourself to using the xenon? What about the other 85% of the fission products? Using 15% of your fissile fuel as propellant seems unlikely to be optimal. In my mind there is a hierarchy of engines: you start with chemical, proceed to solid core NTR (such as NERVA; the only reason we ain't using them right now in space is because of politics),then pulsed NTR (which has an Isp of about 17.000 sec) and the next logical step is nuclear electric. Standard NEP is having a reactor drive an engine and a propellant tank that is separate. The concept I was going for was to have the reactor do double duty, and act as both power source and reaction mass. Though separating the xenon from the salt would still require mass, which may offset any gains I get from saving on reaction mass. As well as revise my info on the pulsed NTR concept (closest thing we have to an actual torchship). Well, molten salt reactors aren't the only way to do the job. Zubrin's nuclear saltwater rockets inject the fissile material into a reaction chamber as a salt solution, with the products directly exhausted as high temperature plasma. No xenon extraction required, you just need to build a reaction chamber and nozzle that can handle a continuous torrent of nuclear fire. And keep neutron reflectors away from your propellant tanks. And never ever spring a propellant leak. As for Blacklight, Mills is a fraud that's been selling his free energy scheme since the early 1990s. Blacklight Power goes by "Brilliant Light Power" these days, probably because Mills had been "about to release commercial products" based on hydrino technology for over 2 decades under the previous name. Oh, I know the man's a fraud. But doctor Marchese's study helped shed light on exactly how they calculate things. Even if said things make no sense physically. Just goes to show ya NASA DOES investigate all manner of claims seriously. As for doctor Zubrin's... uhmmm...nuclear candle....well, when I first read of it 15 years ago, I thought it was crazy. Today...I still think it is. Doesn't help that the good doctor seems to have a vendetta against VASIMR (which, while not the best, is still the ONLY game in town in terms of plasma propulsion; we really need a serious MPD study...). Those superconducting tapes seem to be applicable in many other designs such as ITER (if you could get them to be bolder and stop asking for decades of funding) and even the polywell. I'd concocted a descendant of the NSWR, the Antimatter-Catalyzed Fusion Boosted Nuclear Saltwater Rocket, which uses small amounts of antimatter to induce fusion as a neutron source to allow subcritical fissile salts to be used, in part as an exercise in stacking letters onto an acronym, and in part to propose a system that aims to improve on the safety and practicality of a NSWR by adding antimatter. Zubrin seems to suffer from tunnel vision with respect to getting humans to Mars in the particular way he envisions (one-shot missions using Shuttle/ISS-derived expendable vehicles), and his criticism of VASIMR seems to be affected by that. VASIMR can't get humans to Mars faster than chemical propulsion with any power source we can build in the near future, and he seems to think that's the only thing that matters. But it could get bulk cargos there on longer trajectories with far less propellant mass, and it has major speed and endurance advantages when it comes to sending probes out into the belt and outer system. I would ask, if your intent is to use an antimatter catalyzed reaction, why not go straight to fusion? It'd make the acronym shorter. Note that the above justifications were pretty much an exhaustive list of the design goals. Funny you specifically linked that, I've discussed the ACFBNSWR with Elukka before, and the rather more serious microfission/fusion pulse drive proposals that inspired it. Seems like an Isp of 50,000 would be the limit on ion drives. Last edited by Krulle on Tue Nov 20, 2018 1:03 pm, edited 1 time in total. Time to invent interdimensional transport. funtional interplantery travel would be nice too. It is possible with nuclear engines since, i think, 80s. I'd also accept a laser sail to another star system. Timelapse eyecandy made by ESA astronaut Alexander Gerst, currently on board of the ISS. I remember seeing a video shot from either Mir or the ISS where a backlit Progress was approaching to dock, and you could clearly see the maneuvering thrusters fire. It was pretty cool. I was watching the InSight Mars landing today, and they mentioned that New Horizons (the spacecraft that did the Pluto flyby) is scheduled to reach its next target (Kuiper Belt object 2014MU69 or "Ultima Thule") in January 2019. It's already almost there. It's hard to believe that the Pluto flyby was three and half years ago. They also have an image where New Horizons is trying to detect Ultima Thule visually. It's a reminder of how difficult it can be to detect objects in space against the background starfield, despite the lack of "stealth in space", even when you know exactly what you're looking for and exactly where to look. There may be a lack of ‘stealth in space’, it is also vast. Indeed hard to believe New Horizons fly through is already three and half years ago. The data rate at which the spacecraft communicates with us is currently lower than 5kb/sec. The high-res material will have arrived in a slow trickle, perhaps as a progressive download. When checking yesterday, NHPC signals were received in Canberra at a data rate of 2 kb/sec. This is caused by a modest transmission power (4 watt), the limited size of the spacecraft’s parabolic dish and the distance ~4.13 billion miles (~6.64 billion kilometers). It currently takes New Horizon’s radio signals six hours and ten minutes to reach us. I believe they said it will take 20 months to receive the entire data set.